Violinist Jennifer Koh is an in-demand soloist on concert stages all over the world, but her partnership with Jaime Laredo, her violin teacher when she attended the Curtis Institute of Music, was the stuff of musical kismet. You can catch it even on their new recording, Two X Four, a certain X factor they conjure, between sublime musical energy and clean technique. 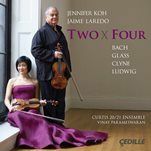 The very well thought out play list of two violin soloists playing four composers explores the duo’s range, with works by J. S. Bach, Philip Glass and the recording premieres of works by Anna Clyne and David Ludwig. What could be more conventional than starting a mixed classical disc with Bach‘s Concerto for Two Violins. Perhaps predictably, but what better way to clearly hear the Koh and Laredo sound in their mastery of the world of Bach. It is more than textbook Bach that commands their creative energy and shimmering technique: it is palpable from the start, and there is immediacy in their playing that builds their edge. Clyne’s Prince of Clouds has disquieting atmospherics from the start, and admirably, unpredictable, unmannered development. A co-commission with Curtis and Chicago Symphony Orchestra, ISIS Orchestra and Los Angeles Chamber Orchestra, Clyne composed it in 2012 with the two violinists in mind as a meditative dual dialogue with orchestra. There are penetrating string effects that in moment seem like electronica or note bending that reminds you of ancient Chinese string instruments. There are string paroxysms, counterpoint pizzicato, orchestral clamor and dramatic arrests, overlays that make it very cinematic, but driving this is the core dual strings narrative. Clyne’s ideas are so cohesive and interesting that at less than 15 minutes the work has an abbreviated quality. In contrast, Philip Glass’ Echorus (1995) has classic Glass hooks applied to a chaconne, its tonal architecture, one sustaining and one developing. This is meditative Glass, well suited to the breadth of tone and texture that Koh and Laredo achieve. Ludwig’s Lost Seasons is a meditation on how he remembers the distinct seasons of his Bucks County childhood and how those natural seasons are now blurry and less defined. Yearning and quixotic string lines create the introspection of “Winter” (unum). It gives way to “Spring” (duo) with violin dialogue, driving orchestral crashing and astringent tones which gives it a sense of inescapable torpor. A parallel drama winds down, and the resolves of “Summer” (tertius), the longest movement, is framed with dark, lurching effects, but it never overtakes the delicate voices of the violins. “Fall” (quartus) just thunders in, violin trills blazing, tempered with discordant tones. There are pastorals and vistas summoned throughout, and Ludwig’s structures are very assessable, full of orchestral colors, allowing for interpretive accents. Koh and Laredo lead through beautiful and harrowing sound fields that inevitably wend toward jarring resolves. Ludwig is everywhere these days. He was one of three composers who were commissioned by the Philadelphia Orchestra for which he composed a bassoon concerto for David Makasawa, and it received great reviews. He also composed his first film score. The violinists returned to their creative environment for the recording sessions that took place in the Gould Rehearsal Hall at Curtis in 2013. Their performances were engineered by the masterful George Blood who makes present every organic dimension. The skill of conductor Vinay Parameswaran with the Curtis 20/21 Ensemble is understated and supple, just as they are in the concert hall.